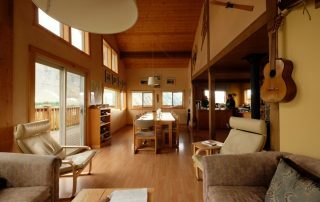 Talus Lodge is a private, chalet style, two-story building providing comfortable backcountry alpine accommodation. 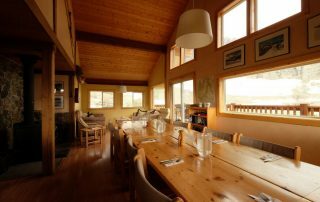 The lodge can sleep up to 14 people. Room options: Double occupancy required. Room #1 and #2. Sleeps 2. Beds can be twin or king mode. Lower level. 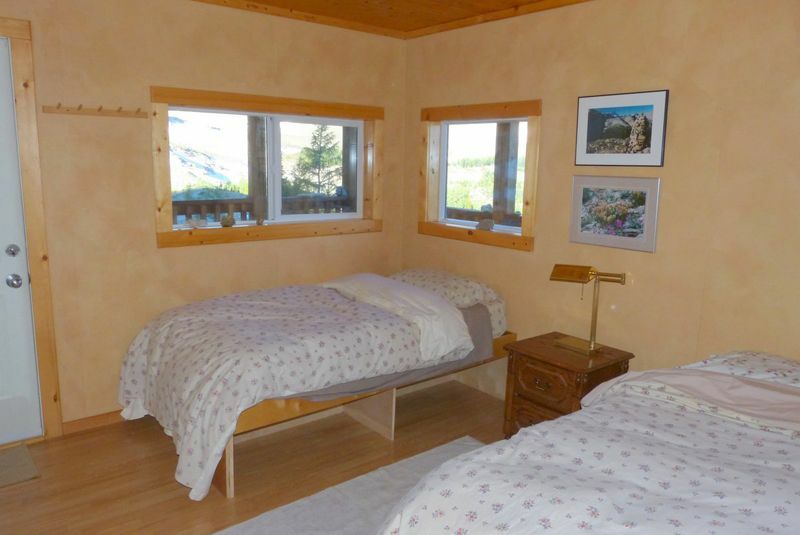 Room #3 and #4: Sleeps 2-4. Double bed plus twin bunk. Can be booked as a family room. Lower level. Room #5: Sleeps 2. Two twin beds. Main level. 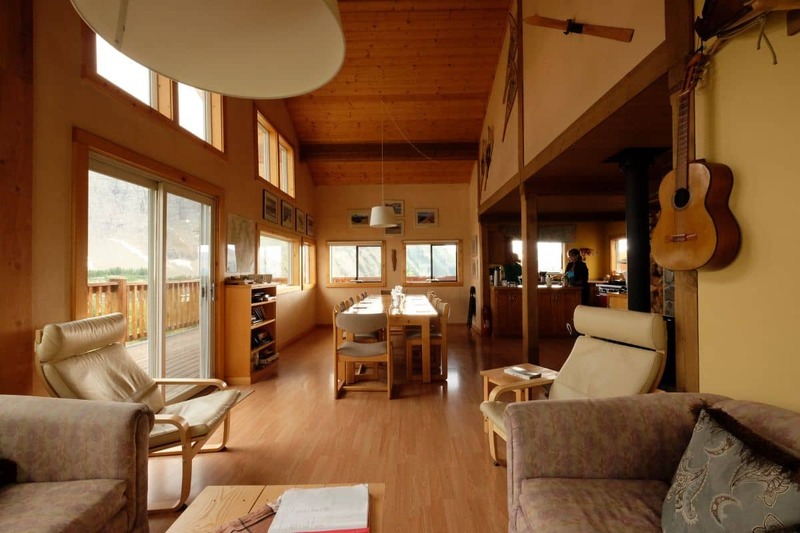 Raven’s Nest: Sleeps 2-3. Three twin beds. Accessed by a ladder and for nimble climbers only. Upper level. Room option: Single occupancy. Dorm style. Upper level. 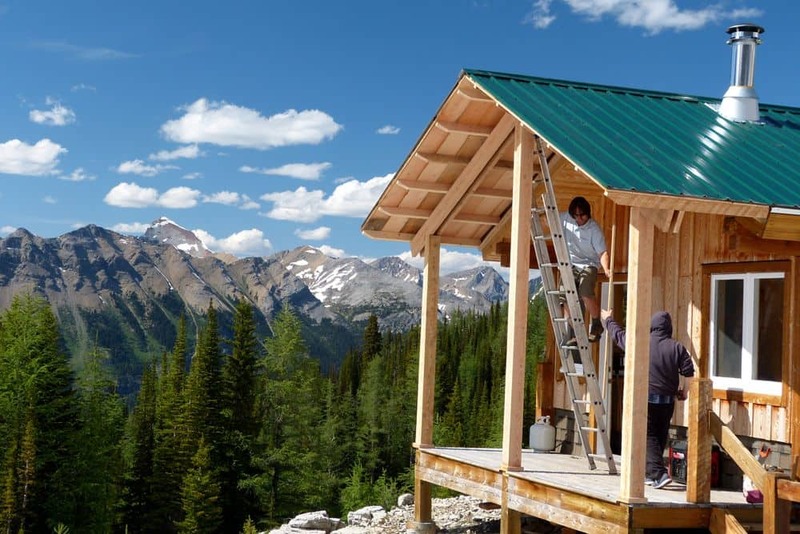 Raven’s Nest: Sleeps 2-3. Three twin beds. Accessed by a ladder and for nimble climbers only. Expect to get to know your bunk buddies. 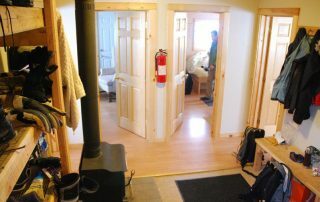 Each lower level room has private access to the lower deck. The main floor contains the kitchen, living and dining area as well as a guest bedroom with two single beds. The Raven’s Nest has three single beds and is located in the upper loft. It is accessible by a ladder and for nimble folks only. Down duvets, linens and towels are provided. 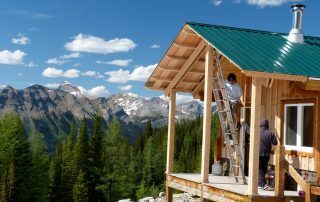 Large upper and lower decks facing southwest add to the outdoor enjoyment of Talus Lodge and provide fantastic views of the remote, alpine backcountry of the Canadian Rockies. 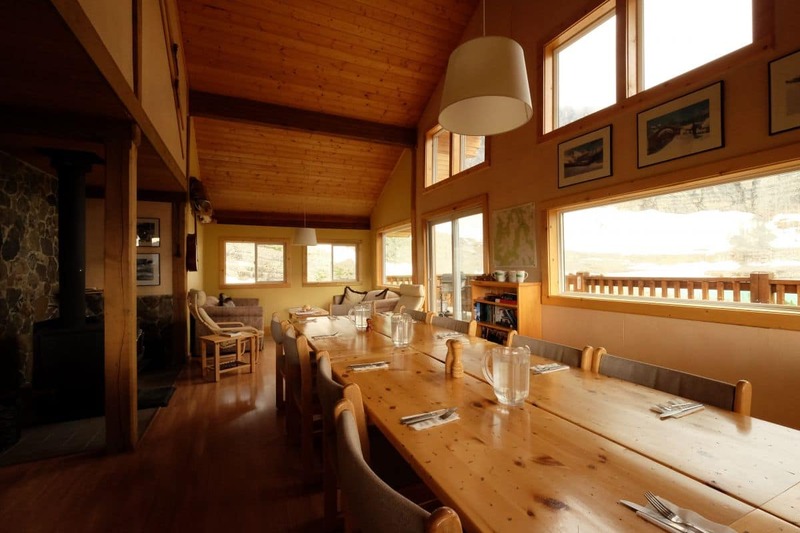 The facilities cabin is attached to the lodge building by a short wooden walkway and includes sauna, watering can showers, wash basins and a separate toilet area with direct outside entry. There are also two outhouses. 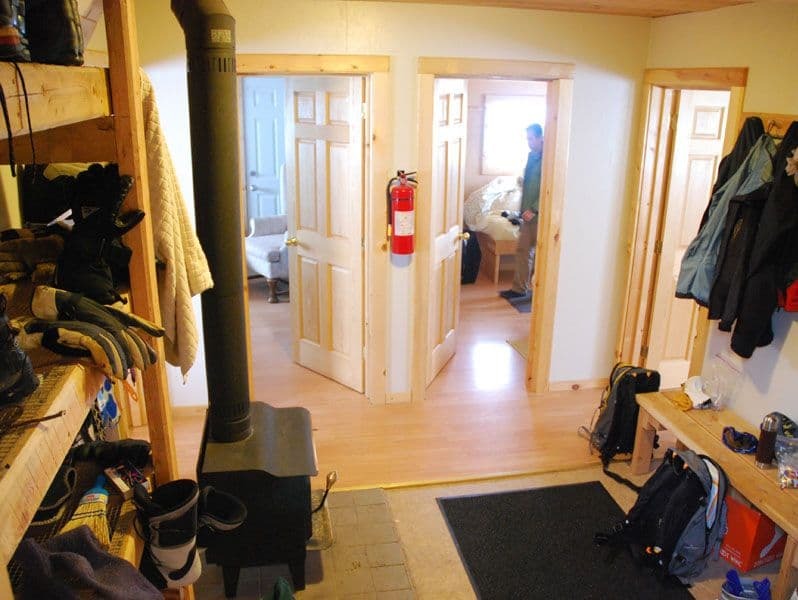 Wood stoves provide heating for the building and propane for cooking. 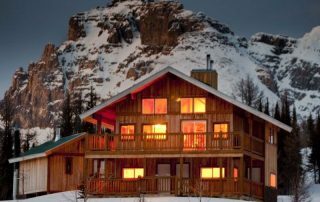 Our solar panels provide electricity for both the lodge and facilities building. Electricity is available for recharging phones, camera’s and other devices. There is no guest access to the WiFi. 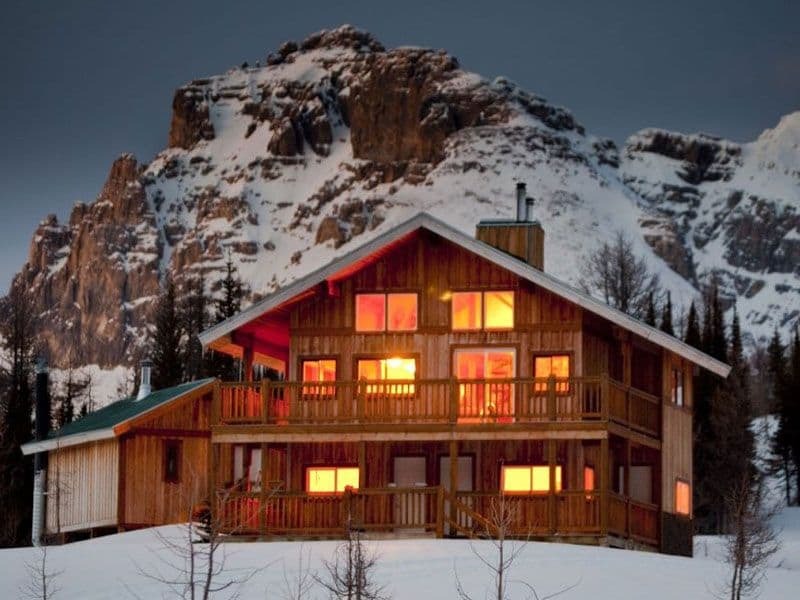 Take a journey for the soul and come hike or ski at Talus.